Grilling and barbecuing is a productive and organized way to play with fire, and will result in food. However, the hazards inherent in cooking over an open flame can lead to burns, blisters, and the loss of hair on your hands and forearms. Heat resistant gloves can save you injury and pain. 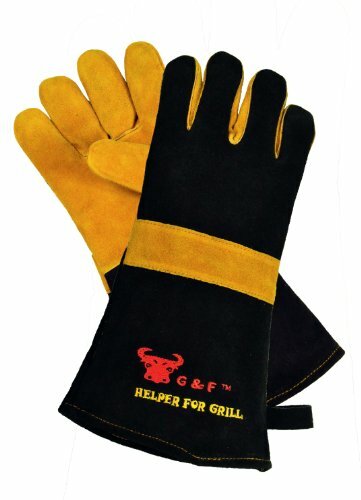 What are the best BBQ gloves? Our top pick is Ekogrips Silicone BBQ gloves. 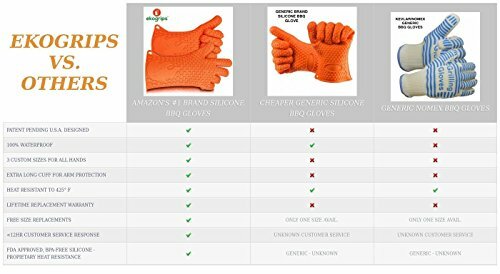 In this guide we will take a look at some of the best heat resistant gloves for barbecue and grilling in our BBQ glove reviews and comparison chart. 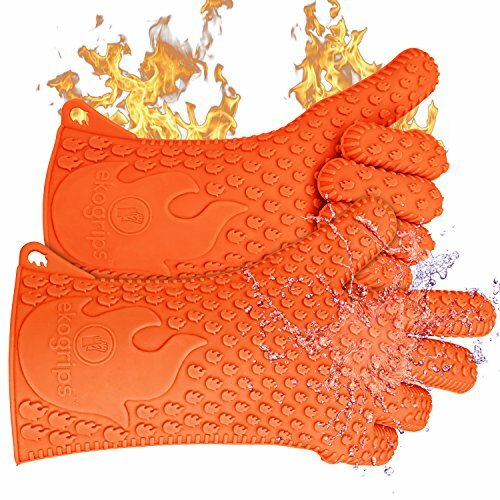 The Ekogrips BBQ gloves are waterproof and heat resistant to 425F. While fabric gloves lose their heat resistance when they get wet, these gloves allow you to handle juicy cuts of meat, grab things out of pots of boiling water or even barbecue in the rain while keeping your hands protected. Above 425F, more heat gets through, but the gloves shouldn’t melt within a reasonable range. This means you can still grab broiled meat out of your oven, for example, as long as you're reasonably quick. The manufacturer of these gloves, Jolly Green Products, has some pretty unique customer service. They offer a lifetime unlimited warranty, free exchanges for gloves of a different size, and boast a sub-12-hour response time to any customer communication. We wish more companies were like this. Because they're totally waterproof, you can toss them in the sink for cleaning and air dry quickly. There are a few important differences between these and fabric gloves. You lose a decent amount of dexterity due to the thick silicone, and the gloves don't have quite the same amount of grip to them. They get especially slippery when they're coated in grease. The little grippers on the outside mitigate this well enough when it comes to flipping meat, but you might have trouble with anything requiring more dexterity. If you can stand to lose a little dexterity, you need your gloves to be easily washable, or you anticipate handling hot things in a wet environment, these might be the right way to go. Ekogrips grilling gloves are definitely our top pick as far as waterproof BBQ gloves go. However, if you need to be nimble and you're willing to keep your hands dry, you should probably choose a fabric pair instead. The Grill Heat Aid Aramid Fiber gloves are heat resistant to 925F, which is quite impressive. You can handle burning logs, charcoal, cast iron pans and heated baking sheets with ease. You'll have no problem manipulating fuel in a 600-degree wood stove or handling a preheated cast iron pan. Above a certain temperature, you'll feel some amount of heat after a few seconds, but you should have more than enough time to finish your task quickly before you burn yourself. Grill Heat Aid has coated these with silicone strips to aid with grip. The fabric itself is pliable and light. You'll hardly feel impeded as you cook. The cotton liner is soft and comfortable. You should have no problems wearing these during lengthy cooking sessions. However, they are not waterproof in any capacity. You can easily be burned through these gloves by steam or hot liquids, and they don't work very well if you get them wet. If you're removing a roast from the oven, you'll want to grip the sides of the baking pan to make sure you don't get burned by steam coming from the meat. That said they're much more flexible than silicone gloves, making it easier to perform any task requiring dexterity. Aramid fiber offers a surprising amount of cut resistance, meaning it's unlikely you'll damage them in casual operation. It's nice to know that you're covered, but we wouldn’t depend on it. If you plan to keep your hands dry, the increased dexterity and heat protection offered by the Grill Heat Aid BBQ gloves makes them a great option. They're perfect for people with wood stoves as well as barbecue enthusiasts who don't mind using tongs or a spatula to handle juicy cuts of meat. 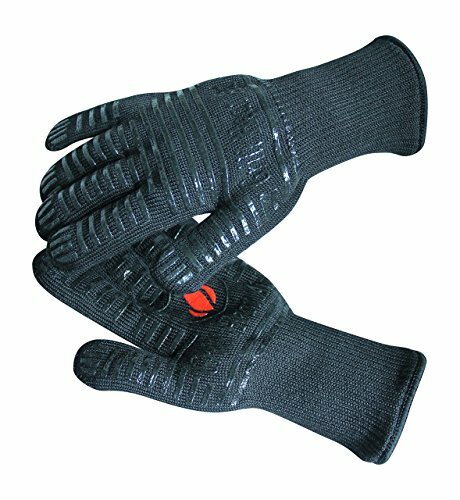 The ridiculous levels of heat protection offered by these gloves let you grab 500F metal or hold burning logs. You're more than covered for any normal cooking task. The gloves are available in two varieties: extra-long for enhanced forearm protection and regular long to keep your wrists covered. So what's the difference between the "aramid fiber" Grill Heats and these Kevlar TTLIFE gloves? Nothing as far as material goes. "Aramid" is a category of synthetic fibers that includes Kevlar. The big difference is that the Grill Heats have a lifetime warranty and the TTLIFE gloves do not. Despite the lack of a lifetime warranty, we think the T﻿﻿T﻿﻿LIFE BBQ gloves are a perfectly fine alternative to the Grill Heats above. The Artisan Griller cotton-lined neoprene gloves are waterproof and heat resistant. They're more comfortable and flexible than silicone gloves while still offering protection from steam and hot liquids. There's no number supplied with these gloves regarding their maximum performance. Similar pairs are rated to temperatures of about 600F, and these Artisan Grillers seem to do just fine with a 500F grill. Still, we wish there was an official number we could use for easy comparisons. The gloves themselves are designed to be roomy and slip on and off easily. The extra room in the gloves doesn't impede with normal barbecue operation. Unfortunately, if you have small (or extra-large) hands, you might want to choose a more appropriately sized set of gloves. If you need something that's waterproof and you don't want to choose silicone gloves, these Artisan Grillers are a great choice. 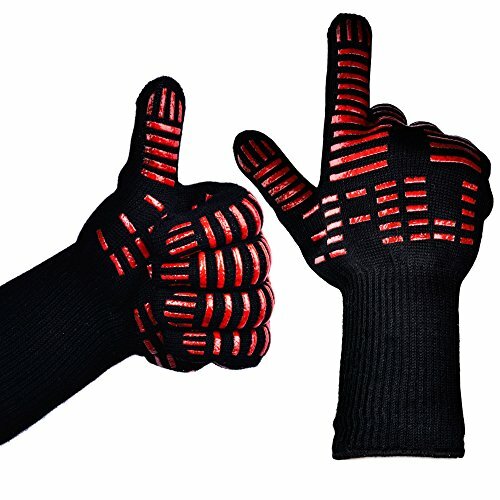 These extra-long gloves are made from thick leather with cotton lining. They're not totally heat proof, so you'll burn yourself eventually if you handle hot things for prolonged periods of time. 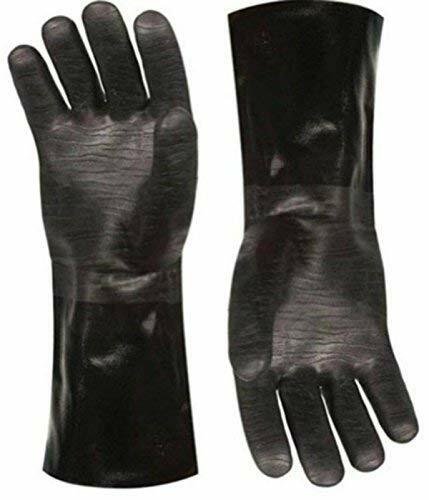 The protection these gloves offer is just enough to handle a hot grill grate or a pot of coals for a few seconds without burning yourself. Why would you buy these gloves? For one, they're stylish and thick, offering protection against splinters from your firewood or uneven edges on your grill. If looks are more of a concern than heat resistance, these might be the right pair for you. Second, you don't need to stick your hand directly on a hot grate. If you're willing to use tools to help handle hot objects and limit your exposure to direct heat, these gloves offer more than enough protection for most grilling, smoking, and cooking tasks. If you want to shove your hand into a fire and grab a burning log, choosing a different pair of gloves might be a wise decision. Alternatively, you can also choose this pair and use a poker instead. Tongs, meat forks and other grilling tools often have long handles and can protect you from exposure to the extreme heat necessary to cook food safely. However, sometimes you need to get in close. Other times, food such as hamburger patties can slip or roll and be at risk of falling through the grate. It may be tempting to reach in and grab a steak or brat. If you're wearing heat resistant grilling gloves, you'll have protection, better dexterity and an easy clean-up after you rescue your dinner. Oven mitts and hot pads may protect you inside, but grill heat is a bit more dangerous. Gloves will give you more dexterity and a stronger grip. A quality pair of grilling gloves will protect you from hot juices, spatter and grease that clings to skin. If your charcoal grill is flaming up or developing hot spots, wearing gloves while working with your grilling tools can help protect you from a nasty burn. Gloves that are too big will slide around and cause you to drop things. Getting the right size grilling glove is critical. If you've got large hands or long fingers, small gloves will be uncomfortable and severely limit your grasping power. While some grillers may prefer a cotton ﻿﻿﻿lining, be aware that this material may well soak up hot grease, increasing your risk of burns. However, a 100% silicone glove will get very slippery inside as your hand sweats. Also be aware that these gloves may be a bit stiff at the beginning, so be prepared to work them until they relax a bit. Kevlar gloves offer protection against cuts and heat, but will be stiff for a while. Aramid fabric is made of synthetic fibers and is extremely heat resistant.​ It may be one of the more ideal materials for flexible gloves. Silicone gloves often have a series of ridges or dots for a quality grip. This is where getting gloves that really fit becomes critical. The best grip in the world won't help you if your hands are sliding around, slippery with sweat in gloves that are too large. The gauntlet of the glove is the portion that covers your wrist and forearm. This protection is extremely important for those using grills with large decks and plenty of cooking space. Silicone gloves can be cleaned in the dishwasher or in the sink as you wash your supper dishes. Drying them by standing them up so that water can drip down from inside the fingers or your gloves may develop an unpleasant odor. Silicone pot holders may not give you the flexibility you need for quick movements. Cotton gloves can be washed in warm water and tumbled dry. Use a plain, non-bleach detergent to avoid rinsing out any heat resistant qualities or glue that holds the silicon dots in place. Leather gloves need to be dry cleaned. If exposed to hot water, they may dry out and split, rendering them useless and possibly dangerous. Grilling is a great way to bring people, food and fun together. However, it can be distracting and dangerous to try to prepare food with guests milling about and children and pets getting in the mix. Heat resistant BBQ gloves will prepare you for any reach and grab emergency you may encounter.